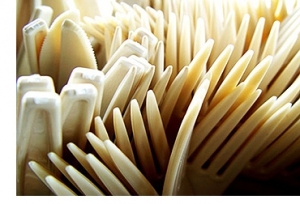 SpudWare® was one of the first bioplastic cutleries brought to market. It set itself apart with its ability to stand up to high heat. Proven time and time again at temperatures up to 266ºF, SpudWare will not melt; it holds its shape and stays cool. And now it’s available in two Earth conscious options. The Original SpudWare hit the scene nearly 10 years ago with the mission of reducing petroleum dependency as it pertained to disposable foodservice products. Using Bioplastic resin made from plants, not fossil fuels, The Original SpudWare cutlery was able to replace up to 100% of petroleum-based ingredients with biobased alternatives. These convenient, disposable forks, knives, spoons and sporks are just as strong as traditional plastic cutlery. With an attractive natural beige color, The Original SpudWare is 6″ long and available in loose bulk and as wrapped sets. Custom printing is available for the wrapped sets. Contact your BioMass Packaging salesperson for more details. SpudWare Compostable, like the name says, is 100% Compostable. With the advances in bioplastic technology, SpudWare Compostable was born. Also made from plant based resins, this new generation of SpudWare is certified BPI compostable, and will breakdown in 180 days when disposed of in an actively managed municipal or commercial composting facility. Diverting your disposables away from landfills to the compost pile can help save the planet from excess waste. SpudWare Compostable’s sleek, elegant design was created with high-end dining and catering in mind. At 7” in length it feels more like traditional flatware than most disposables and with its reinforced neck it performs that way too. Embossed with “SpudWare COMPOSTABLE” on the handle to help communicate a green message and demonstrate a commitment to making the world a better place by using sustainable products.